This week's Sous Chef recipe comes from one of the many, many, (many) copies of Everyday Food I've been collecting for a long time. I love zucchini, and I was really tired of pasta with red sauce, so this pricked my interest. Prep: This comes together really easily. It takes only a few minutes longer than pasta does to boil, so it's quick to get on the table - maybe 20 minutes start to finish. In the recipe from the magazine, it makes use of zucchini that was grilled earlier in the week, so if you're able to do that, it's a one-pot meal, too! I never had that ready to go, so I just sauteed the zucchini while the pasta cooked, and it worked fine. 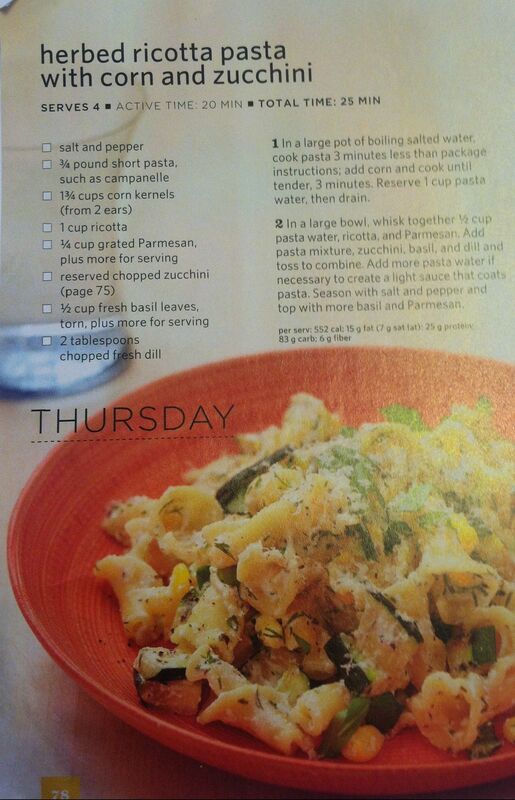 Taste: I think this is a really tasty dish, and fairly healthy - I use full fat ricotta but you could sub low-fat with no problem. I subbed dried herbs for fresh ones, simply because that's what I had on hand, but I bet with fresh this would be amazing. Reception: Baby M thought this was awesome (toddler friendly!) but Peanut thought it was just okay. He's not crazy about corn, but I think he felt, as I kind of did, that while this is good, it needs something else to make it a meal. It's not quite protein-y enough for a main dish, but awfully filling for a side dish. It'll stay in my repertoire but I'll have to figure out a filling second dish to serve it with. Suggestions? Anecdata: Makes enough for two adults with one meal of leftovers. Reheats okay; cheese gets a little gritty as opposed to the smoothness when it's fresh out of the pot.